In a recent worldwide poll a survey was conducted to find the world’s favourite food the outright winner was Italy. Pizza’s and pasta’s were by and far the biggest winners, but when it comes to music, the Italians are not so prolific. Having a quick look at solely Italian acts with more than half a dozen UK hit singles and you’ll find there are only three, Mauro Picotto and Clubhouse have had seven each, but the winner is Black Box who have scored 11. When it comes to Italian one hit wonders, well they have scored, to date, 99. Renato Carsone & His Sextet were the first in 1958 and the most recent was Riva Starr whose was a featuring singer with Fatboy Slim on his 2013 number three hit Eat Sleep Rave Repeat. Today’s subject is Ryan Paris, whose only UK hit, Dolce Vita reached number five in the autumn of 1983. Ryan was born Fabio Roscioli in Rome on 12th March 1953. As a teenager he learned guitar, but what did he do after leaving school, Ryan explained, “I was studying and teaching guitar and music therapy, I was also acting in films, playing with my different bands, composing songs and enjoying life.” His acting career began in 1978 in the Italian film Battle of the Stars. Then in 1984 he had a small uncredited part in Once Upon a Time in America starring alongside Robert De Niro and Joe Pesci. Dolce Vita started receiving airplay in his native Italy, but how did that song come about? Ryan: “Well, I was preparing songs in Italian to participate to the first Rock Italian Festival in 1982 and my keyboard player had to go for one year army service. So I was looking for a new keyboard player and I met Pierluigi Giombini, composer, player and artistic producer. One month after meeting him, he presented a new song to me called Dolce Vita. The funny thing was that I brought to him to listen songs from me, but singing in Italian by me and he said, ‘I am doing only English’ and he let me hear two tracks, Masterpiece and You Are A Danger, which were number’s two and five in the Italian chart at that moment. I remained folgorated (sic) by the sounds and the melodies of Giombini and I told him I would bring him one of my English songs. That night I composed a new song and three days later I presented it to Giombini who loved the song. We worked on my song two times and one day Giombini told me, ‘I wrote a song for you but it is not a rock song’. When I heard the song I really made a big jump because it was very nice. It was my first record, I didn’t have any experience but I was sure from the beginning that Dolce Vita would do something.” The song charted all over Europe and sold over five million copies. During the nineties, Ryan has collaborated with the producers of Enigma, Snap, No Mercy, and Culture Beat and has also produced tracks for use in Coca-Cola adverts. Another track he composed, Magic Fiesta, was used in a radio ad for Fanta in Switzerland. He is still recording, in 2010 he released the track I Wanna Love You Once Again which garnered sufficient radio play across Europe. 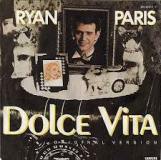 The following year a remixed version of Dolce Vita reached number 54 place in the French chart. Today Ryan lives in Germany, “I married a Dutch girl and she was living in Germany. After Giombini, in Roma, I didn’t meet another good producer and musician, so I decided to live in Germany. I am divorced but I stay in Germany now because of my little son. In 2013 another new song, Sensation of Love with featured a Bulgarian singer called Valerie Flor made number 15 on the Bulgarian chart. This year Ryan has done many concerts in Europe and two big shows incorporating the Grande Manifestation Musical Children of the 80s at the Hard Rock hotel in Ibiza.